*For serving: Kelchner’s Creamy Horseradish Sauce, Tartar Sauce, Sriracha Sauce or Cocktail Sauce. In a medium mixing bowl combine the crabmeat, bread crumbs, green onion, Kelchner's Tartar Sauce, egg white, Kelchner's Hot Mustard, lemon peel, and black pepper. Mix well. (If mixture seems dry, stir in 1 tablespoon of tartar sauce). Gently shape mixture into 4 patties. Spray a shallow baking pan with nonstick coating. Place patties in pan. Bake in 350 degree F oven about 15 minutes or until the patties are a light golden brown. 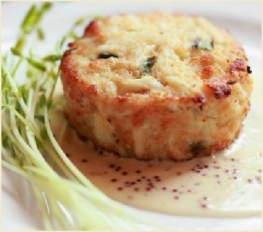 Serve with Kelchner’s Creamy Horseradish Sauce, Tartar Sauce, Sriracha Sauce or Cocktail Sauce.